Actor R. Lee Ermey. The drill sergeant from "Full Metal Jacket". I thought he died two years ago, but it doesn't appear that's the case. This Guy from my my Church when I was about 14. I totally got my retirees mixed up, and thought the wrong guy died. So I'm sitting in the hallway at church, and here comes the dead guy in white robes walking toward me... Well, as I mentioned, it was a case of mistaken identity, and the other guy was in the choir. But for about ten seconds there, I thought the dude was haunting the @#$% out of me. Zsa Zsa Gabor. Apparently... still alive. Musician Matthew Sweet. I have no idea why I thought Sweet was dead, but I was surprised to see he had a new album in a recent issue of Entertainment Weekly. He could have been pulling a Tupac, I suppose. But a quick Wikipedia check indicates the guy is still alive. New Kids on the Block. Apparently still hangin' tough. They have a new album, too. Have you ever thought someone (famous or otherwise) was dead, but they weren't? A) If you don't watch Venture Bros., I can't help you. 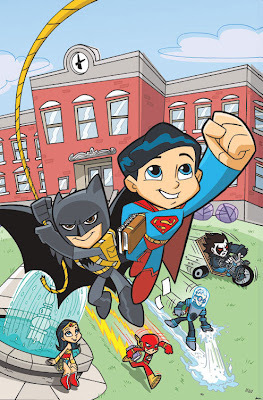 They're introducing DCU Elementary at some point soon, which will feature the mainstays of the DCU re-imagined as kids in school. 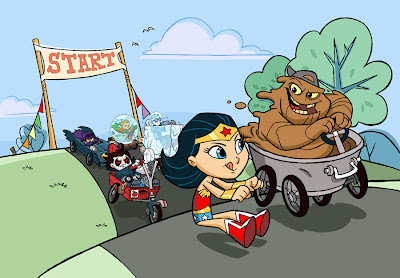 Why is Wonder WOman/ Girl just sitting there? I can't tell you how brilliant I find this image. 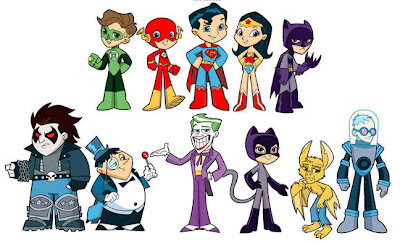 The DCU Elementary clearly isn't too hip yet to that whole "integration" thing. Seriously, DC? This is a technical thing, but DC Comics is currently in a legal dispute with the Siegel family regarding ownership of the character "Superboy", which led to the removal of the 90's-introduced Superboy from the DCU proper. I wonder what they'll call Clark? But its also a great story without all that stuff, too... Anyway, this is another comics-related chairty sort of thing, but the guy is asking for a lot less money. D) Every once in a while I really wish I were in New York. Apparently there's going to be an original all-tap-dance opera about Superheroes coming to the Big Apple as part of a festival. Were I there, I would be all over this. So yesterday I watched a movie I'd DVR'd over the weekend "Out of Africa". It was a movie I was pretty sure I'd seen before, but realized I'd only seen a few bits, and running at 2 hours, 45 minutes, I had seen only a snippet. The story is based on the book and, roughly, life of Karen Blixen (pen name Isak Denisen), and her years living on and running a farm in Kenya from the mid 1910's to 1931. The cast is led by Meryl Streep and Robert Redford, who were revered (for right or wrong) during the 1980's in a way that is no longer in practice for a mass audience, although internet noise may be giving me a false impression, what with how many sites insist I love Megan Fox of Transformers fame. And it's not hard to see how Streep gained the reputation she's still riding, even when she partakes in more whimsical movies like "Mamma Mia!" these days. The pacing is glacial, but still engaging. Director Sydney Pollack (whose only other work I've seen is "Tootsie" and "Jeremiah Johnson"), doesn't quite insist on the dreamlike state of a Terrence Malick movie, but lets the wide open setting of the African foothills and the years in which the story occurs dictate the pacing of the story. The story shouldn't have been the sort of thing I would normally get wrapped up in. In many ways, its a domestic melodrama that happens to stretch over years among aristocrats acting as lords of the manor, pushing back against the march of progress. And, were I thinking of a paper to write in film school, most certainly one could have a field day comparing and contrasting Scarlett from "Gone with the Wind" and Karen Blixen. Streep's Blixen, accurate or not, is a powerful character, and is most likely the sort of role actresses are seeking when they complain that there are no good roles written for women. What's daunting in our post-PC era is guessing how the relationships actually worked with the colonists and the folks already living on the land which they carved up. But the messy relations of the colonists, and especially Blixen's relationship with Denys Hatton are easy enough to buy into without the usual eye-rolling moments of romantic plots. While watching the movie it struck me how seldom I take time for movies that don't star superheroes, robots, aliens and/ or gorillas. Maybe a good part of that is my intolerance for the movie crowds that I recall putting up with at the multiplex in Gilbert, Arizona when we'd go see movies like "The Aviator" (which I really wanted to see), or even a flashier movie like "Chicago". I also made a comment to Jamie, as the movie was wrapping, that they really don't make movies like "Out of Africa" anymore. 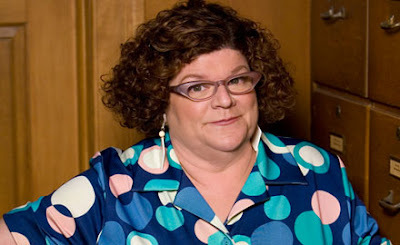 Jamie disagreed, and in retrospect, I have to agree with her. I just don't go see a wide variety of movies anymore. I sent Jamie with Nicole to go see "Atonement" without me, but I honestly don't know how it stacks up. Sometimes its better to let the "epics" stand some test of time rather than walking into a movie that is desperately trying to emulate greater movies, and just doesn't really pull it off. I was burned out by the "Upstairs, Downstairs" type films, and movies about crossing over class lines in British society that, really... Until someone has something new to say about the caste system of early 20th Century Britain, don't call me, I'll call you, "Gosford Park". Your mileage may vary for "There Will be Blood" (Steven), but at least the movie unapologetically set its own pacing and wasn't afraid to tell a multi-year story. Curious that movies that are so formal in so many other ways from a technical standpoint are most often the ones that bend the rules of hard pacing Hollywood so adores. And I'm not one to usually buy into epic love stories. Because I get terribly impatient with people I actually know in romantic entanglements, I really don't want to see two people pine for each other for 2 hours on screen. And maybe Blixen's direct approach to the romance in her story won me over for that exact reason. It makes the arc of the whole thing feel that much less like Hollywood machinery. Perhaps as the fall begins to roll out "serious" movies, I might quit being The Grinch and try something a bit out of my comfort zone. Jason will be delighted to hear lions appear several times in the course of the movie. A new post up about the value of a single vision within the DCU. The REAL news is that Leaguer Simon has joined up at Comic Fodder. He's reviewing collections and trades, I think, which will fill a HUGE gap in the Comic Fodder galaxy of stars. Here's his first post on Ellis and Cassaday's "Planetary". Ahhhh... It's that time in a young country's life when so many things are due for a change. That country keeps hearing about "Change" and may even be discovering girls (on the ticket). The site was originally a bit more political. I was deeply dissatisfied with the Bush administration and the push to war in Iraq (do not equate this with a push into Afghanistan or other Al Qaeda related pushes of the day). The American press was rolling over for talking point dispatches, and more than I was bothered by Bush's strategies, I was deeply bothered by the way the press was happy to play along. 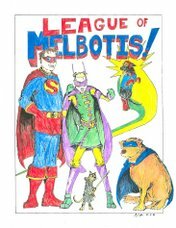 I should note, the force singly most responsible for the creation of League of Melbotis is a thought-provoking conservative in his own right. And while he and I could disagree, there was always an opportunity for me to see things from a new angle. I have no idea if he felt the same way, but that was something I could take away from it. That's really all I ask out of political discussion. Rational discourse. Keep the emotion to a limited degree (I've been known to get pretty hot about certain issues, I confess), and trying not to deny logic in an argument. I started LoM in the Boogeyman Era of politics, where the call of the day was "If you don't support X, you hate America", "If you don't buy into Y, you hate our troops", "If you don't agree to Z, you hate freedom", and, my favorite "You're trying to appease the terrorists!". No other time in the history of man has the phrase "appease" been bandied about so much. For me, the end result of the Bush/ Cable News era, sadly, has been a sneering cynicism about politics in general. Cynicism = bad. If you find our system goofy, go live in Canada, right? Whatever. Instead, it's been a 7 year lesson in watching the entire populace (who supposedly took high school civics) look the other direction as the law and basic decency have been put to the curb for expediency. Worse, possibly, it's ingrained in me a cynicism about party loyalists of any stripe. If folks will believe anything That Guy says, why should I believe anything Our Guy says? It's sort of left me with the impression that we are not so far away from our silver-back respecting primate cousins. There's a reason that against all logic, we spent 100,000 years erecting kings to live in palaces while we toiled on turnip farms and paid them taxes, believing God himself had selected Our Guy for the job. When push came to shove, if we backed Our Guy and adorned him in jewels and let him kick the crap out of us, maybe when the jerks from the other side of the island showed up to kill us and take our turnips, our belief that Our Guy was the REAL guy (and not THEIR jewel adorned guy, who was so obviously a jerk) God would help us smite our enemies. And because winners tend to write history, sure, God was on our side. Despite our proclamations of love for the system, I'm not convinced we're not all secret monarchists at heart, in search of a king (or queen). We choose our candidates by how they support the lifestyle we believe we (and everyone else) should be living. We don't look to candidates to change our ways with new and challenging ideas. Every four years is a chance to crown new royalty, and to feel some small victory when or if the victor is the one who confirms our preconceived notions. If Our Guy wins, things will be better for everyone. He will protect our turnips. Or at least the way we think turnips should be raised and distributed. If the other guy wins, we'll all be turnipless. The improvement in the situation is that we have an opportunity to choose which guy we're going to go with on this turnip situation very four harvests. A bit of personal frustration I find in myself is that I absolutely have knee-jerk reactions, and despite the abundance of information available on candidates and their game plans for the future that I came to a decision so quickly regarding who was My Guy. I found myself rationalizing criticisms of My Guy, and backing shakier criticisms against All Those Other Guys. As it's become Our Guy vs. Their Guy (and Our Guy-1 vs. Their Guy-1), things are starting to get serious. But I don't take any of the candidates all that seriously. You can't. I often have no idea if My Guy's plans will work. It's just that My Guy's plans sound more like something I'd do than The Other Guy's plans. When I hear our two candidates talking about their energy plans, is it really that shocking that the solution they came up with matches the preconceived notions of their party faithful? Is the science behind what their saying a legitimate response? Why the @#$% are we asking politicians (of all people) how we should be moving forward with energy solutions? Why aren't we finding out what the facts and science are from someone who doesn't have a political stake in this stuff (such as Ms. Paris Hilton)? We're looking to our Officially Anointed and Elected Sun Gods to pretend they know how to do everything from run international tariff laws to understanding the complex issues behind our natural resources. Luckily, they gladly fake authority and certainty on such topics, and we go right along with it, mostly because it fulfills the conclusions we've already come to. The fact is, it's a single vote I'll cast in November. In a state that is massively, proudly Republican, it totally doesn't matter what I think (no matter who I vote for). The arcane and out-dated workings of the electoral college tell me that voting in National Politics is, in fact, pointless. And with the results of the 2000 Election, I'm kind of inclined to think the whole thing is so astonishingly flawed that its going to come down to the fact that we have a Republican-placed Supreme Court, anyway. It doesn't mean I won't vote. It's just... you know, I'm not completely dumb nor overly illogical. And it sure as hell beats the alternative of not having any say. That's been our lot for the vast, vast majority of human history. And, I don't think too kindly of that particular right being infringed upon. So I vote more for the ritual of the thing, and because I have hope that one day a vote will actually count for something (we do live in a Republic after all, not a true democracy. But things change.). And that my vote can be a reminder to The Other Guy, if My Guy does lose (and he probably will), that nobody walks into office on a 100% mandate. Anyone taking the Oval Office should remember that almost half the country didn't want to see them in office, and keep that in mind when they start making decisions. We choose our kings and queens in odd ways and maybe by asking the wrong questions. And certainly by expecting them to be all knowing and seeing with their army of advisors. I don't know what criteria we should be using to make our decisions, but too often we seem to make our decisions based on someone else's checklist. And maybe that's what needs to change a bit. A quick PS: I am neither for or against Sarah Palin, Joe Biden or anyone else seeking office. I've given Palin a hard time the past few days here at LoM and Steanso's blog. This is not to suggest anything about Palin (other than that probably Photoshopped pics with accompanying taglines are amusing). Here's a hoax link. I could care less about Sarah Palin or Joe Biden other than their official capacities, and more or less the same about McCain and Obama. If you are in some way related to any of these people and become offended by future links regarding stuff I find funny, then my apologies. Any hang up other readers have regarding the sun god worship of candidates is their own. I assure you, all of this will get stupider before it gets better.